I'm running PyCharm 3.0.1 under windows 7. While I can use Git for operations against the local repository (albeit, very slow), I get some generic failure errors whenever I do anything that has to do with the remote (e.g. a pull). Like I said, the error is very generic and I don't see any logs that would give me more information about what actually went wrong. is there a way to enable more detailed git logging? 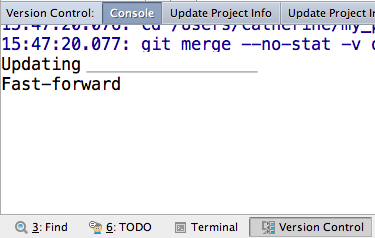 try Console tab in Version Control toolwindow. Ok, so one thing I'm noticing is that Git Bash pulls certificate data from c:\users\dmitryb\.ssh, but PyCharm goes to a different .ssh location. How can I tell PyCharm to use c:\users\dmitryb\.ssh? I was having this same issue. I had to rename the ssh keys to their expected defaults, id_rsa and id_rsa.pub. After that, it worked.